Using 5.9.4, and it STILL doesn't consistently remove STP cookies on quit and restart of Safari Technology Preview. Safari is working fine. STP occasionally is being cleaned up, but most times starts and shows a few dozen cookies resident. @SweetP Thanks for the quick response!! 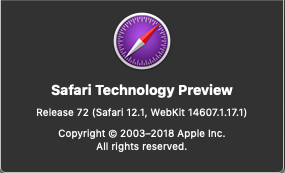 I'm running both Safari Technology Preview Release 70 and Safari Version 12.0.1. Cookie 5.9.2 is working fine with Safari, but in Safari Technology Preview, while it IS able to remove history, if that option is selected, it never removes cookies (I can remove them using Safari Technology Preview's Manage Website Options tool). So what could be the problem? I've installed both the CookieScripts and CookieTPS scripts and Cookie 5 does have Full Disk Access. I have quit and restarted everything, rebooted a couple of times, and no joy with Safari Technology Preview. I do not have any checkboxes for deleting history checked, yet since upgrading to 5.5.2, History is empty after a Safari restart- Safari v. 10.1 (12603.1.30.0.34). Safari internal prefs are set to delete history older than 2 weeks. Anyone else experiencing this? I'm running Sierra 10.12.4 on a mis-2012 13" MacBook Pro. I'm seeing the same thing; spinning gear is nearly always present in the menubar. It says "100% completed (1 of 1)". It would be nice if it would appear while active, and then go away. I'm running OS 10.11.5 Beta (15F24b)... maybe that's in play here? My version of Cookie is 5.0.5, and NOT on the beta track with Cookie.